As with anything, the key to a perfect end product lies in its preparation. Prep your food with inadequate Food Preparation Equipment, and you are facing an uphill battle to present a meal your customers will appreciate. Whether you are going to slice meat, prepare dough, or blend sauces, the right equipment is mandatory. With proper initial preparation, the remaining steps of obtaining your final product will flow much more smoothly and economically. 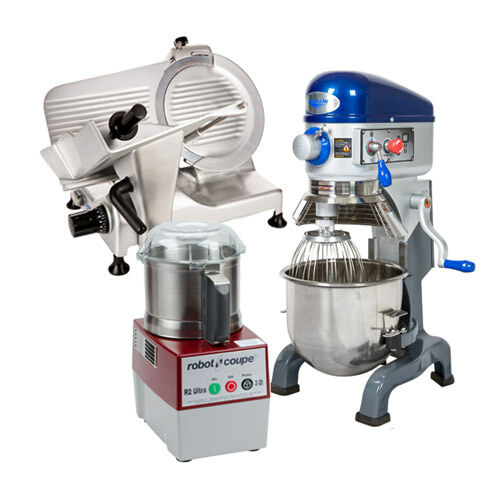 Vortex Restaurant Equipment has a wide selection from dough prep machines, food processing, food packaging, meat prep machines, mixers, slicers, scales and vegetable prep machines. This Berkel 823E-PLUS manual gravity feed slicer is perfect for light volume applications that require about 1 hour or less of meat slicing per day! Berkel Model 825A-PLUS manual gravity feed slicer features Berkel’s hollow ground chromium-plated, carbon steel knife and built-in sharpener. This Berkel 825E-PLUS manual gravity feed slicer is perfect for light volume applications that require about 1 hour or less of meat and occasional cheese slicing per day! Berkel Model 827A-PLUS manual gravity feed slicer features Berkel’s hollow ground chromium-plated, carbon steel knife and built-in sharpener. This Berkel 827E-PLUS manual gravity feed slicer is perfect for medium volume applications that require about 2-3 hours of meat and cheese slicing per day! Berkel Model 829A-PLUS manual gravity feed slicer features Berkel’s hollow ground chromium-plated, carbon steel knife and single lever. Berkel Model 829E-PLUS manual gravity feed slicer features Berkel’s hollow ground chromium-plated, carbon steel knife and built-in sharpener. Doughxpress DM-18 is a quick, safe way to flatten your pizza dough without the need for flour, multiple pass dough rollers, and best of all, no skilled labor. Doughxpress DMS-18 is a quick, safe way to flatten your pizza dough without the need for flour, multiple pass dough rollers or skilled labor. The DXM-SS is the stainless steel manual model and is the fastest and easiest pizza press to use. Set your temperature and thickness, pull down the handle, and it will give you consistent results every time. The efficient, economical, and durable TXM-15 is the 15 inch manual tortilla press with a swing away design for easy placement and removal of up to four tortillas. With 43 years of proven press design and manufacturing expertise, HIX Corporation introduces the efficient, economical, and durable TXM-20. Doyon spiral mixers are engineered to ensure the most reliable machine you can own. The secret lies in the synchronized rotation of the hook with the bowl, the bow high center mid-post, and the design of the hook. Doyon spiral mixers are engineered to ensure the finest and most reliable machine you can own. The secret lies in the synchronized rotation of the hook with the bowl, the bow high center mid-post, as well as the design of the hook. The Doyon DL12DP dough sheeter is an efficient two stage machine featuring a front in feed and discharge. Ergonomic design makes it easy and simple to operate. Doyon’s most compact one pass sheeter with front or side operation. Ergonomic design makes it easy to operate.The DL12SP crust sheeter is an efficient one stage machine featuring a front in feed and front discharge. The Doyon DL18DP dough sheeter is an efficient two stage machine featuring a front in feed and discharge. Ergonomic design makes it easy and simple to operate. Doyon’s most compact one pass sheeter with front or side operation. Ergonomic design makes it easy to operate.The DL18SP crust sheeter is an efficient one stage machine featuring a front in feed and front discharge. The perfect manual kitchen tool : simple and practical to use for rapidly and efficiently dicing vegetables. Its patented grid system made with surgical stainless steel blades, ensures a clean consistent cut of vegetables and fruit. With it’s unique cutter blade, it will liquefy most of your preparations. It has been designed to work in containers holding up to 200 liters (50 gallons). Our classic model, manufactured since 1991, this great mixer is built to last. It mixes purees and emulsifies up to 100 l. (25 gal) with ease. The smallest mixer of the Senior range. It mixes purees and emulsifies up to 40 l. (10 gal) with ease. Junior Standard is the Junior range smallest model, light and powerful. It mixes purees and emulsifies up to 6 gallons with ease. A truly professional mixer for small preparations. Light and user friendly (2.2 lbs. /990 gr. ), strong, quick and efficient motor (13,000 R.P.M. ), includes four interchangeable mixing blades and detachable shaft. With the largest selection of Salad Spinners in the foodservice industry, Dynamic has your lettuce drying needs covered. The Dynamic SD92 good for 20 litres / 5 gallons. With the largest selection of Salad Spinners in the foodservice industry, Dynamic has your lettuce drying needs covered. The Dynamic SD92SC with its sealed cover lid good for 20 litres / 5 gallons. With the largest selection of Salad Spinners in the foodservice industry, Dynamic has your lettuce drying needs covered. The Dynamic SD99 good for 10 litres / 2.5 gallons. Edlund outstanding electric tomato slicers also slice soft fruits and vegetables fast! You’ll get clean-cut uniform slices every time, even with overripe, soft tomatoes. There are lots of Manual slicers out there that will slice hard products like onions and potatoes, but they don’t do a great job on soft products like ripe tomatoes. Edlund’s ARC XL stainless steel manual slicer takes on the big guys that other slicers are afraid of. The big beefsteak tomatoes and the colossal onions that are just too big or too hard to slice in other machines.